For women who are thinking about entering the trucking world, do not let anyone tell you that you can not succeed in this business. You can read about Lillie Drennan who was the first woman truck driver in 1929 to receive her CDL. This is great reading for men and women both. Many women also own their own trucks, their own trucking company, or are involved in other "more elite" truck driving jobs and careers. Even I rose to Safety Director and I loved that job. Pick up the free trucking magazines at most truck stops and read about the industry. Lots of great articles in them to help drivers. Driving on the highways for a living is not as scary as you may think. Yes, there are safety concerns for all who share the road. But if you use common sense and good judgment you'll do just fine. As far as your safety when you're off the highway, women think about this more than men. I know I did. Again, safety while away from your family and friends is important to all drivers. Because I was focused on finding safe parking, I rarely drove the number of hours I legally could have driven in a day. For starters, I always tried to pick truck stops that were open 24/7 if at all possible. Since there is generally not enough parking available for trucks, I would shut down a bit early in order to find a safe spot. I normally didn't drive those extra few hours and wind up in a small "mom and pop" truck stop that was closed or out of parking. If I had to be in a truck to make a living, I was going to have the security of a place that was open for food and restrooms. This did not work all the time, but things don't always go as planned. Stopping early may have cost me a few miles each week but I was willing to accept that trade off. I also did not park in the back of the lot if my preferred spots in the front or middle were open, especially the ones that were next to the lights. I never, ever parked on the on ramps. Since I drove for a big company, I tried to park next to the other company trucks. In my mind it helped knowing that my co-workers were parked right next to me. I also parked as often as possible at my company's terminals. Again, this may have lowered my mileage some, but the trade-off was that parking was available along with food and showers. I could also get my truck serviced if need be. Another thing I tried to do was act and walk with confidence even though I may have been shaking on the inside at certain truck stops. I never had anything happen to me, and maybe it was not my time for it. 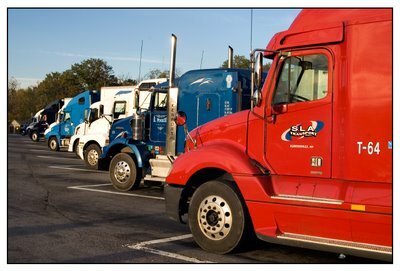 I've found that most truckers stick together and want to help each other. A woman driver gave me a tip that I used each night. Besides locking the doors at all times, I took the passenger seat belt, put it thru the door handle, and then fastened it. I liked that idea. I even did it with the driver's door. This gives you the extra few seconds you need to act by blowing the horn and making lots of noise. An air horn going off at 2am is going to get a lot of attention, and likely bring help. I always had some extra gallon jugs of water with me. You must stay hydrated. Paper towels and moist towelettes also came in handy for a quick cleaning. I always had snacks handy because you will sometimes either break down, be waiting for your load, or simply not have enough time to stop for a "grab and go." I was never without a flashlight or boots and rain gear, either. There might be a drought where you are now, but you never know what awaits you up the road. Sometimes I had bad luck and the trailer that I was picking up or dropping off wound up in a mud hole. Sometimes the dock you're at is an inclined dock and it has water six inches deep where the landing gear is. Then, of course there's always the unexpected things that happen like water main breaks. Lastly, you need to keep your feet warm in the winter time with a good pair of boots. My tire thumper was also handy, along with my cell phone. It was also suggested that I might want to wear a whistle around my neck for more security, so I did that for a while. Truck driving in general is a safe career for women, and if you'll use common sense when you're out there on the road, you'll likely do just fine. I am just thrilled that I get to have my DOT physical done again. Mine expires tomorrow. The medical card I carry is good for 2 years. Bummer.